Pixel 3 vs iPhone XS vs Galaxy Note 9: which phone takes best pictures during the day? 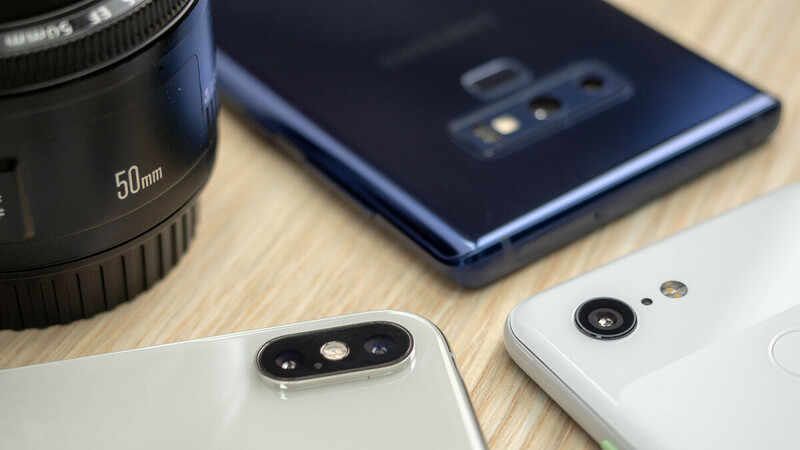 In our quest to find out which phone has the best camera this year, we compare the Google Pixel 3, the Apple iPhone XS and the Samsung Galaxy Note 9, in not juts one quick shoot out, but in a detailed, multi-round comparison. After taking a look at their front cameras and portrait mode capabilities, it's time for the big test: which phone takes the best pictures during the day? We are using the auto mode with the default settings. We think this will be the mode most people will shoot pictures and experience the cameras. We kick things off with our test picture where we compare the image quality of the three phones to a real camera, the Panasonic GH4 that we use in the office. No camera is quite the same in terms of the way it render JPEG images and this color science is probably camera companies' best-guarded secret, so take this as a reference rather than the end-all, be-all standard. Right off the bat, you can see that all the phones amplify and boost contrast and saturation a lot more than the GH4 does. The other big difference is in the dynamic range: just as you'd expect with the much bigger sensor on the GH4, the transitions between different colors are much smoother and more pleasing. Between the phones, you can see that the Note actually did worst in terms of white balance, as it captured everything with a yellow tint. The other two captured the whites in the imagei in a more natural way. You can also see that the iPhone capture the brighter exposure, while the Pixel went with a slightly darker image, something that is a trend that you will see further on. Next up, we have the three contestants facing each other. Starting with the Pixel 3, we have a very, very dramatic image as if a giant thunderstorm was approaching. Problem with this is that in reality, it was an overcast day, yes, but in reality, the clouds definitely did NOT look so dramatic or threatening. This image is the equivalent of fake news: it looks appealing and shocking, but it has very little to do with reality. The iPhone captures a much more realistic picture: the correct color for the skies, a proper exposure, everything is spot on, and you have good amount of detail resolved. The Galaxy Note 9 has also captured a very decent photo with slightly colder colors, but the one issue here is that the slight detail in the sky is lost as the highlights are burned. One more photo with the clouds confirms what we saw in the first photo: again, a very dramatic portrayal of the scene by the Pixel, which might look appealing, but is definitely not how things looked in real life. The more mundane reality of that overcast day is again well captured on the iPhone and the Note. The iPhone once again rescues detail in the skies, while the Note burns that area of the image, but for all else the latter two images are quite comparable. A bit of the blue in the skies shows in this photo and we see again how the Pixel takes that little hint of blues and saturates it and paints everything in stronger, clearly oversaturated tones. The problem here is with the slightly dark exposure of the photo and the way the shadows in the photo are too dark and it's hard to see much in terms of detail. The iPhone reaches a good balance of colors with both more realistic color, yet still with pleasing colors. The Note 9, on the other hand, completely messes up with the clouds and the whole image seems noticably overexposed. In this scene, we once again see the differences between these cameras clearly: the Pixel shot the darkest picture, the Note 9 had the brightest exposure, and the iPhone strikes the middle ground. Notice the HDR artifacts around the roof of the building on the Pixel photo, this is definitely a turn-off and makes the image look artificial. And the Note has once again lost the clouds for some reason. We see more of the same in this next picture. This one is interesting: it's a close-up shot of the fir tree branches which are green. Well, not if you look at the pictures from the Pixel and the iPhone. The iPhone is the worst offender, as the needles look almost bluish on it. The Galaxy Note does the best job with color accuracy here. Starting with the Pixel here, the park did look a bit gloomy with the overcast weather and everything, but not quite as dark as on this underexposed photo. So again, we have this issue with underexposure during the day with the Pixel. The iPhone captures a neutral-looking, rather realistic picture with no added filters, while the Galaxy Note 9 also captures a true-to-life and well-exposed photo. However, everything seems to blend to just one green-yellow tonality on the Samsung, as if there was a filter applied to the image, while in reality there were at least some different colors. By this time, you could have probably guessed which photo comes from which phone without looking at the image captions. Yes, the underexposed photo comes from the Pixel, the slightly overexposed one - from the Note, and the middle ground is what the iPhone captures. Last, but not least, we took this close-up shot of a leaf to see the differences. Not surprisingly, the Pixel took the darkest picture, but we like the colors here as they appear well balanced. The iPhone boosted the yellow tones making them look almost orange and ended up with a hugely oversaturated photo that looks doctored. Finally, the Note 9 took a very pleasing image with a slight warmth to it and a proper exposure. We have seen one recurrent theme with day photos for each phone: every single time the Pixel took darker images that looked a step underexposed and it consistently altered the colors of images to make them more dramatic than in reality. This is an effect some may like, but it's far from realistic. Also, we noticed that the screen on the Pixel was the darkest of the three phones and when you look at the pictures outdoors it's often hard to see what's on the screen, which really is a shame. The iPhone stuck to a balanced exposure and colors that looked way more realistic, yet still appealing. There is a bit of added contrast here too, but not quite as much as on the Pixel. The "signature" of iPhone photos is that yellow-green tint that it applies to all images and especially to people's faces. This is an effect that we don't particularly like, but apart from that, the dynamic range, the sharpness, everything looks very good. The Galaxy Note 9 has a fantastic, big screen that was the brightest of them all and on this display pictures from the phone looked incredibly well. When we looked at them on a monitor at the office, though, we did notice that it was not quite perfect: the Note consistently gets images that are a tiny bit overexposed and it consistently loses the clouds and the skies in a picture, burning those highlight areas of a photo. So... which phone has the best camera for daylight photos? Each of these has its pros and cons, and while we could pin-point easily that the Pixel is great for night photos, it had a lot more issues with daylight photos and it seems a bit behind the other two. The iPhone has stepped up its game with the Smart HDR option in a big way this year, and the Note is a close runner-up. These are our favorites, but we are looking forward to hearing your thoughts about 2018's best camera phones in the comments section below. Which one do you prefer and why? WELL... i'm glad we got a test scene with a great camera... and i'm suprised because it's picture looks.... not so great compared to the phones (as if the colors were smoothed out somehow)... which all put their own spin on things... but scene 6 and 9... you got to be kidding me someone f'd up! Overall, these photo shoot contests are in clearly in favor of the Pixel 3. My XS Max does a much better job in most of the shots. Those photos look like their is filter applied and not the original photos that were taken. Whereas the Google Pixel has a darker image to appear more saturated. Do not trust how these look based on the photo shoot outs. The iPhone had the best picture of the "Test Scene". Hands down!!! Bawes on other reviews I've seen, when it comes to the iPhone vs the Note: Both SuoerSaf and Margues have both stated that it seems with the bnb latest models, both Apple and Samsung have switch places. SuoerSaf states a d PA shows here an I agree, it appears Apple has gotten so much better with things like dynamic range, whichbis what effects the appearance of clouds or sky color in general. In the last, Samsung sky shots were more on point and now they have soften and totally over exposed them, while that is how the iPhone use to do them, and now the dynamic range is better and the color is better. But it still has a major drawback that the pixel and Note still do better at. The iPhone is still terrible in processing shades if gray, brown and green. The iPhone cameras has certainly been lacking over the last 3 years, so its nice to see they have fixed some of the cameras issues. Not they need to fix the issue with faces and color tones of skin. Very unrealistic. PA stop cropping the photos. Just leave them at full resolutions. Or at least place a link so we can see the original uncapped photo. Because when you guys crop photos, they seem to lose sharpness and detail and look noisy and grainy. All of those pictures should be far and away more clearer than they are. If you go and look at SuoerSaf side by side video of the Note vs the XS, and the Pixels; his pictures look way more detailed and sharp. Another day, another camera test article at PA.
Fair camera comparison with one issue , well not entirely the issue but rather shortcoming, you failed to mentioned. IPhone lifting the shadows to much and image looks somewhat washout. Its not a matter of taste because simple histogram tool n Photoshop confirms it. I am surprised, really surprised this year Pixel does not deliver day light photography. Oversaturation is obvious too often and somewhat too dramatic processing. A little heavy , exaggerating wihout much of need for that. By the way a lot reputable websites provide original image link to view images in full res. It would be great to have here too since you have nothing to hide. Guys review all of Pixel’s photos. After reviewing them it looks a lot dimmer with a some sort of filter on all of their pics. It does not present a bright white like the iPhone. Look at the Test Photo as an example. Pixel 3 shots look like somebody has applied some weird filter at times, looks good in some shots but can also look quite odd.. Note 9 was most consistent imo. iPhone was decent overall but nothing special, that neon image was hilarious. It's funny because it's more about software processing these days, who got it right? well nobody got it 100% right, that's for sure.